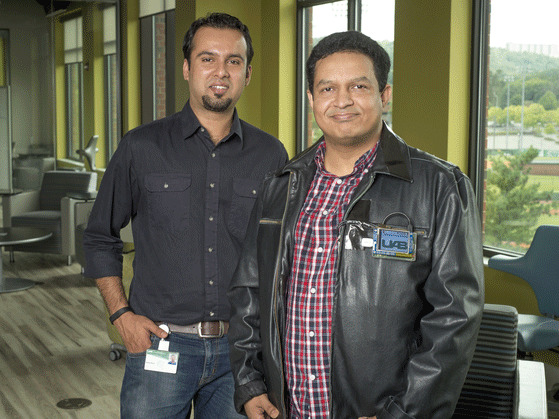 Using 10 low-cost, credit-card-sized computers called Raspberry Pi's, an old winter jacket, three power banks and a small remote touch screen display, Hasan and Khan developed a wearable system that brings all mobile computing solutions together, creating the ultimate smart device. 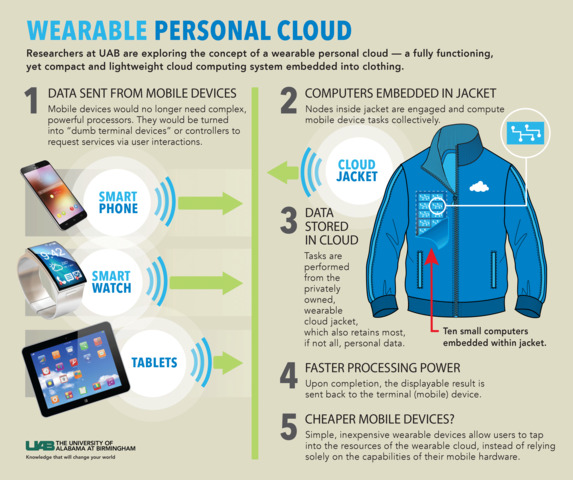 The cloud jacket could make the design of mobile and wearable devices simple, inexpensive and lightweight by allowing users to tap into the resources of the wearable cloud, instead of relying solely on the capabilities of their mobile hardware. "Currently if you want to have a smart watch, smartphone, an exercise tracker and smart glasses, you have to buy individual expensive devices that aren't working together," Hasan said. "Why not have a computational platform with you that can support many forms of mobile and wearable devices? Then all of these capabilities can become really inexpensive." Most wearable and mobile devices are made with processors that are nearly 10 times slower than desktop or laptop processors, limiting the types of applications that can be run on them. With mobile apps' becoming more complex, newer, more powerful versions of mobile and wearable devices are continuously released in order to keep up with changes in technology, resulting in increased prices. "Our overall approach is to create a generic atmosphere or platform that users can customize to fit their needs," Khan said. "The wearable cloud can act as an application platform, so instead of modifying or having to upgrade hardware, this wearable model provides a platform, and developers can build anything on top of it." With a wearable cloud, mobile and wearable devices would no longer need complex, powerful processors. By turning them into "dumb terminal devices" or controllers, the wearable cloud would provide the experience of a smart device. By connecting the terminal devices via Bluetooth or Wi-Fi, a user utilizes the devices to request services via a user intuitive display and interactions. The computational task is sent to the wearable private cloud. "Once you have turned everything else into a 'dumb device,' the wearable cloud becomes the smart one," Hasan said. "The application paradigm becomes much more simple and brings everything together. Instead of individual solutions, now you have everything as a composite solution." Hasan and Khan's wearable cloud concept differs from existing "smart clothing" solutions in that they only act as input devices. Current products such as the Levi's "Smart Jacket" allow a user to make hand gestures on the jacket to answer a phone call or shuffle through a playlist. "With seven to 10 people wearing such a cloud together, they create what we call a hyper-cloud, a much more powerful engine," Hasan said. "The jacket can also act as a micro or picocell tower. All of its capabilities can be shared on a private network with other devices via Wi-Fi or Bluetooth. If a first responder is out in the field and doesn't have complete information to act on a mission, but someone else does, it can be shared and updated through the cloud in real time." "Another potential application area that we are looking into is hospital gowns," Hasan said. "When a patient comes in, they are connected to monitors to obtain heart rate, blood pressure and other vitals. Whenever a patient has to go to the restroom or needs to be moved around, they have to take everything off or maneuver around with a large pole carrying all of the connected devices. Instead, we are putting sensors inside a vest that can be placed over the hospital gown itself. There will be a small version of the wearable cloud within the vest so that the vest itself can collect information, like a patient's temperature."